FILE - Samantha Power, the United States' U.N. ambassador, and Burundian President Pierre Nkurunziza speak to reporters in Gitega, Burundi, Jan. 22, 2016. The government of Burundi says that it hopes members of the U.N. Security Council who were in Burundi for two days got a chance to see for themselves that the reality on the ground sharply differs from what is related by some local and international media. 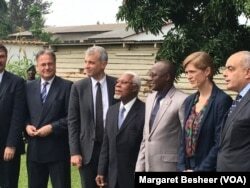 Despite the announcement by Samantha Power, U.S. ambassador to the U.N. and head of the UNSC delegation, that not much was achieved during the two-day visit, the government of Burundi argues that it was able to show its hosts that security prevails across the country on one hand, and that it is open to a national dialogue on the other. Burundi First Vice President Gaston Sindimwo, who was interviewed by VOA last Friday after he met with the UNSC members, said that he asked the Security Council to stop looking the other way while a foreign country continues to train and to organize rebel attacks on Burundi. FILE - Burundi's first Vice President Gaston Sindimwo, third from right, and U.S. Ambassador to the United Nations Samantha Power take a photograph at his residence in Bujumbura, Jan. 22, 2016. Sindimwo also said Rwanda should take part in the ongoing national dialogue as "it has a hand on the current political crisis." "We told them that based on weapons seized and fighters who were arrested, most of the weapons and the majority of fighters come from Rwanda, where they receive military training,” he said. “We have reiterated our call to the Security Council to ultimately heed our call and stop looking the other way so a formal investigation into the role of Rwanda in destabilizing our country, could be launched." “We have also asked that Rwanda take part in the ongoing dialogue as its role in creating mayhem in Burundi has now become indisputable," Sindimwo added. In addition to the dialogue among Burundi stakeholders, the Burundi first vice president said he had a discussion with members of the UNSC regarding the African Union's resolution to send a 5,000-member protection force to Burundi. Sindimwo said that, overall, the government of Burundi had constructive and productive talks with members of the U.N. Security Council and hoped that collaboration and partnership between Burundi and the UNSC and other regional organizations would only get stronger.